The Newport Mansions Wine & Food Festival, one of the East Coast’s most sophisticated and anticipated events, returns for its 10th year from September 25 – 27, 2015. Once again, the Marble House lawn will be the setting for the two-day Grand Tasting, which offers guests the chance to sample hundreds of wines from around the world and cuisine from nearly two dozen regional restaurants and caterers. 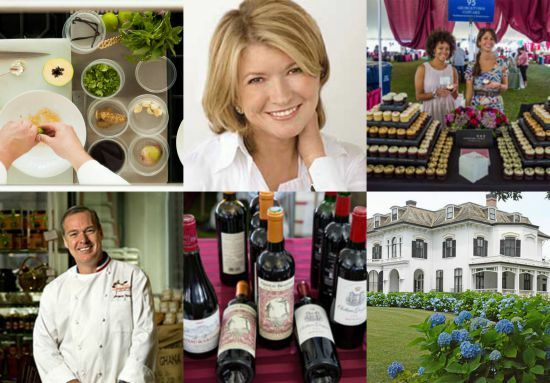 Martha Stewart will return to the Newport Mansions Wine & Food Festival for her second year, headlining a brand new signature event with French chef Jacques Pépin. During A Conversation with Martha Stewart and Jacques Pépin, guests can enjoy a lively and engaging conversation with the lifestyle expert and the French chef while sipping Champagne Taittinger in the Marble House Gold Ballroom before heading out to the Grand Tasting. Chef Pépin will also join daughter Claudine Pépin for a cooking demonstration on the KitchenAid Culinary Demonstration Stage during Sunday’s Grand Tasting. Claudine Pépin joined her father in preparing delicious meals and sharing cooking techniques on three public television shows and has served as a Brand Ambassador for Moet & Chandon and Dom Perignon Champagne. She recently wrote her first book, Kids Cook French, a collection of thirty favorite, simple, classic French recipes in both English and French, illustrated by her father Jacques and daughter Shorey. The elegant Friday night Wine & Rosecliff gala will feature a special selection of fine wines and food amid seaside Gilded Age splendor. Also returning is the Collectible Wine Dinner at The Elms on Saturdaynight. This esteemed dinner will give guests the chance to taste and learn about a variety of high-end collectible wines paired with delectable dishes. All of the wines will be hand-selected by the Festival’s Director of Wines, Michael Greenlee, a 25 year veteran of the industry. Guests will have an extra opportunity to enjoy late night bites and cocktails by some of the Festival sponsors with the return of Newport After Dark, taking place on Saturday night at Forty 1˚ North on the Newport waterfront. Seminars will take place on Friday at the Hotel Viking Newport, allowing visitors the opportunity to learn about wines from different regions of the world. Guests are encouraged to ask some of the industry’s most respected experts about tasting, pairing and buying of wine. The Presenting Sponsor of the 2015 Newport Mansions Wine & Food Festival is FOOD & WINE Magazine. Additional sponsors include National Trust Insurance Services, KitchenAid, Alex & Ani, Atria Senior Living, Newport Hospitality, Inc., Hyatt Regency Newport, Hotel Viking Newport, Residence Inn MarriottNewport/Middletown, The Newport Harbor Hotel and Marina, Alaska Seafood, Chef Works, Arrow Prestige Limousine & Coach, Marchesi Antinori, Maple Leaf Farms, Ruffino, Dock & Harbor Maine, Harney & Sons Fine Teas, WhistlePig Rye Whiskey, Verterra Dinnerware, Meridian Printing, Brinley Gold Shipwreck Rum, Bouchaine, Coravin, Guittard Chocolate Company, Champagne Taittinger, Sequoia Grove, Nobilo, Coca Cola Bottling Company of Southeastern New England, and United Airlines. All proceeds from the Newport Mansions Wine & Food Festival benefit The Preservation Society of Newport County, a non-profit organization accredited by the American Alliance of Museums and dedicated to preserving and interpreting the area’s historic architecture, landscapes and decorative arts. Its 11 historic properties—seven of them National Historic Landmarks—span more than 250 years of American architectural and social development. For more information and to purchase tickets for the 2015 Newport Mansions Wine & Food Festival, visit www.NewportMansionsWineAndFood.org, or call (401) 847-1000.